Most of America stood together in mourning the victims of the horrific shooting in Las Vegas. Oftentimes, the aftermath of tragedies like this ends up bringing Americans closer together. But two NFL players decided to use it for their own agenda, and what they did will make your blood boil. Only hours after the shooting in Las Vegas, during the Monday night football game, everyone except two players stood for the National Anthem. The majority of the players understood the sacrifice the brave law enforcement officers underwent the night before, and as a sign of respect, they all stood in solidarity. 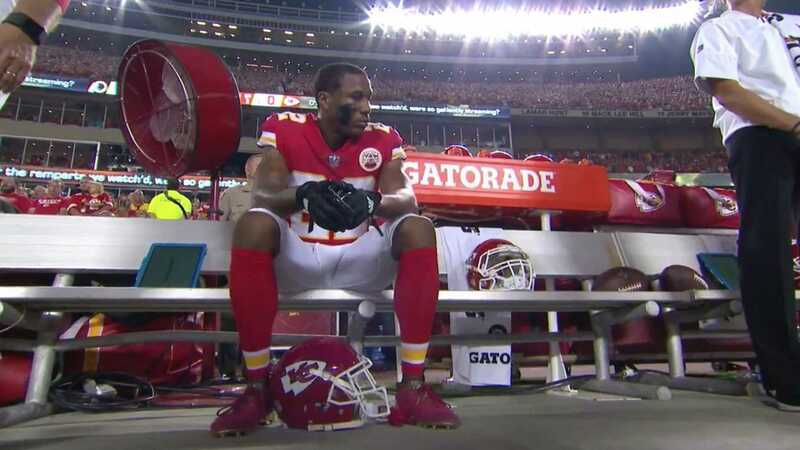 But two Kansas City Chiefs players, Marcus Peters and Ukeme Eligwe remained sitting on the bench in an act of defiance and disrespect. “In the wake of the biggest mass shooting in the history of the United States, only two players sat while the national anthem played ahead of the Monday night football game. Just a day after a 64-year-old shooter opened fire at the Route 91 Harvest concert leaving 59 dead and over 400 injured, the Kansas City Chiefs hosted the Washington Redskins. While dozens of police officers and first responders put their lives on the line to save the victims of Sunday’s attack, two players still felt the need to sit during the national anthem on Monday. The Redskins stood and linked arms for the anthem as did several players on the Chiefs sideline. However, Kansas City cornerback Marcus Peters and linebacker Ukeme Eligwe sat during the playing of the national anthem. As ESPN’s Sean McDonough noted, Peters has been sitting for the anthem for weeks. The amount of disrespect it took to sit out the National Anthem after a tragedy like the one in Las Vegas is mind-boggling. Less than 24 hours after law enforcement officers put their lives on the line, they chose to disrespect their country and flag. The shooting in Las Vegas took the lives of 59 innocent Americans. Most of America has stood together with those who lost their lives, and their families. “Protests” like the one seen during Monday night football are designed to do nothing but divide Americans. That is why many Americans are tuning out of the NFL, and sponsors are dropping like flies. Do you think players who sit out the National Anthem should be fired?